"I just can't see the potential". I've heard this multiple times and I'm always looking for ways to help buyers look past simple cosmetics so they can really get a great deal and a great home. Cosmetic could be something as simple as new paint. I've walked into homes with bright pink bedrooms, orange bathrooms, and blue kitchens. Painting is probably the easiest cosmetic fix to tackle. It's amazing what a little bit of paint will do to change the entire atmosphere of a room. But what if it's something more than paint? Cosmetic can also mean changing lighting fixtures, mirrors, changing out popcorn ceilings or paneled walls, and of course, the flooring. 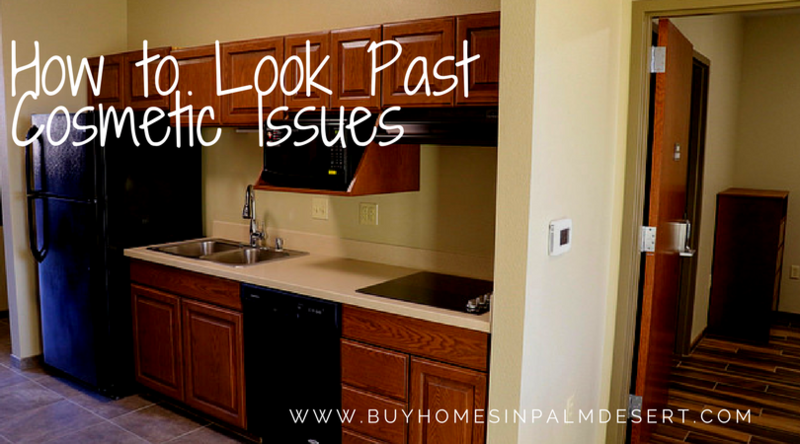 Things can get a little bit more expensive the more cosmetic issues you have but there are some that buyers can't see past at all. Some flooring buyers cannot see past. Maybe because it's a 1970s loud and busy tile or Formica, or maybe it's just a messy house. Some buyers can't even see past items that will be taken out of the home once they buy the house because they simply clutter up the bones and the basic layout of the house itself. I try to tell my buyers not to look at the stuff in the house but to look at the house itself - the space! Imagine walls with a neutral gray or beige, well-placed furniture and furnishing pieces that accent the room, open it up, and create a setting or environment that's welcoming and inviting. Other cosmetic issues could just be too numerous to overlook. If buyers feel that they have to replace every single lighting fixture in the house because they are dated, cracked, or old, the dollar signs start rolling and things can get very expensive quickly. If it's just a few little touches here or there, try to imagine what the house would look like with modern or updated fixtures and finishes. Faucets, doorknobs, mirrors, lighting fixtures, trim or molding, fireplace accents and sconces can all be updated one at a time at a fairly inexpensive cost. What I try to impress with my buyers is how much they will be saving by buying a home that has a few cosmetic errors. But, you definitely want to look into things that are beyond the cosmetic look. Electrical, wiring, plumbing, roof, foundation, any past destruction, and septic issues are major issues that should not be overlooked. These major issues can be a deal-breaker because it's more than a couple hundred dollars worth of repairs. Anything that you can change over time but still live in the house comfortably should be considered a cosmetic repair. Thousands of dollars to dig up the septic system or replace the roof, should be heavily considered during the home inspection process. But again, you may not realize these major issues until you have the home inspection, which is typically after you've already made an offer. Again, simple things like paint, flooring and fixtures should all be considered cosmetic repairs. Unless major appliances are missing that were not stated in the listing agreement, most cosmetic repairs should not be a deal-breaker. Ask your real estate agent how to look past some of these issues in order to get a great deal on a beautiful home. Give me a call today if you're looking for a discount and a bargain throughout the Palm Desert real estate market. There are lots we can get our hands on before they even hit the market.